A contemporary wedding is one that is so NOW and so YOU. It can be a mixture of traditional and modern elements, and it’s really about playing up the personalisation and choices that 100 percent fit the bride and groom. 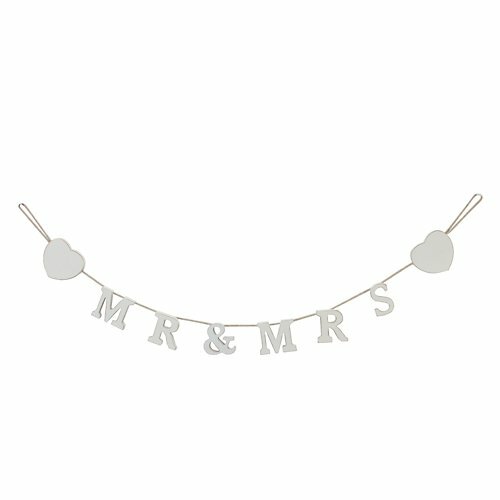 So, which contemporary wedding accessories make you smile? Are you contemporary-glamourous? Or, perhaps you lean towards contemporary-artsy? Or, you could be contemporary-traditional with modern-day décor elements yet old-school in the ceremonial department. Here are five fabulous options for different areas of your wedding. get a super-cool contemporary favour box that is like a work of art and adds interest to your table settings or gift area. 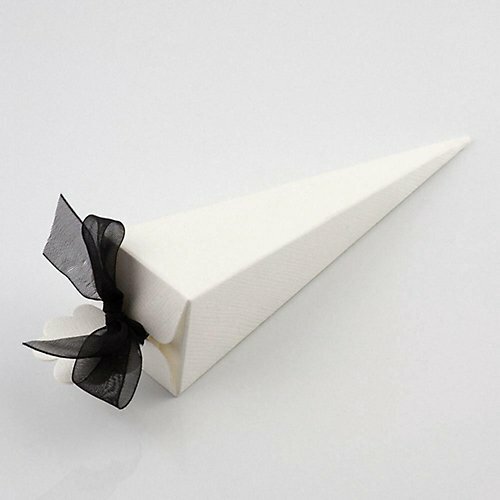 This White Silk Cone Favour Box, for example, which boasts a subtle textured finish, is an architectural addition to your wedding décor. 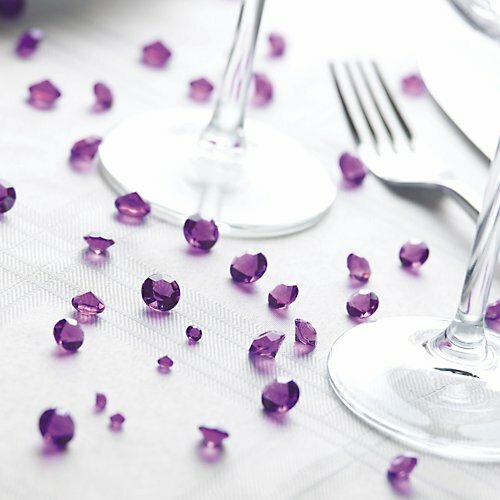 Jazz up your tablescapes with festive table decorations, like these Table Crystals. They are a glamourous way to make your tables sparkle, and come in several different colours to match your wedding décor. If you like it a little glitzy-like, these “diamonds” are a girls’ best friend. Mr. and Mrs. = You! Don’t neglect your walls or airy spaces when it comes to wedding decorations. Consider a banner celebrating your new status, like this Amore Mr. and Mrs. Wedding Bunting with two sweet hearts on either end. You can hang it behind your reception chairs, over the cake table or wherever suits your fancy. Aw, sweet hearts for sweethearts. 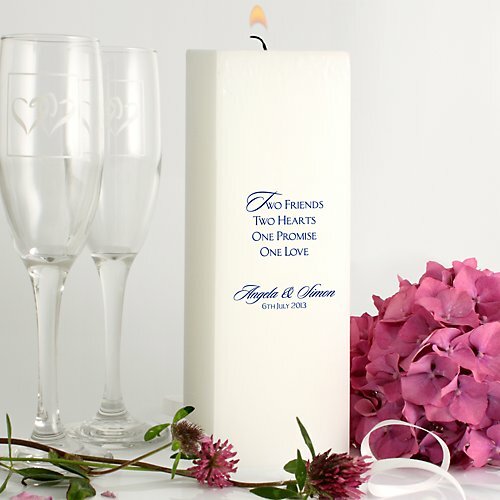 Candle wedding accessories symbolise two becoming one. For a contemporary wedding, a large Personalised Candle that’s very simple and square with a nice verse, wedding date and bride and groom names is perfect. Customised coasters are one of those tiny details that totally add extra flair to your wedding…and will be something guests pocket as a keepsake! 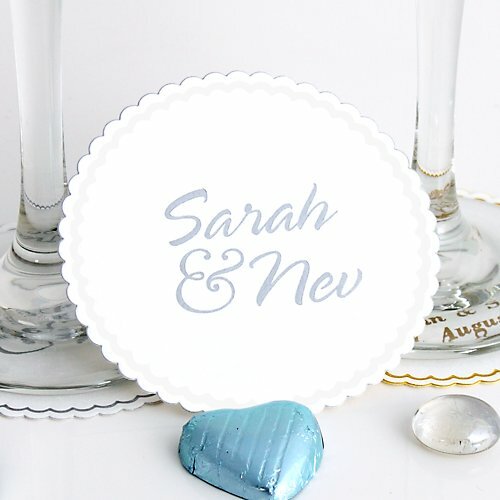 These cute Round Coasters on white disposable paper feature pretty scalloped borders in white, silver or gold. Stack them up on your bar, at the cocktail hour or even on reception tables if it’s a more casual wedding. Cheers! 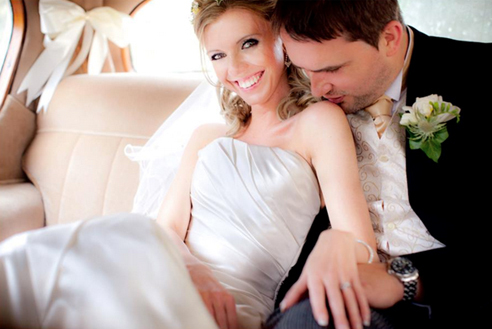 Are you having a contemporary wedding? Find all of the items listed on this page and so much more when you browse Bride & Groom Direct’s collection of wedding accessories. Ellie is our resident blogger of all things wedding related.